It all started on July 20, 1969, when Apollo 11 landed. Astronauts Neil Armstrong, Michael Collins, and Buzz Aldrin left a mirror on the Moon’s surface 49 years ago. This mirror was placed so that astronomers could fire lasers at the moon to calculate its distance from the Earth. 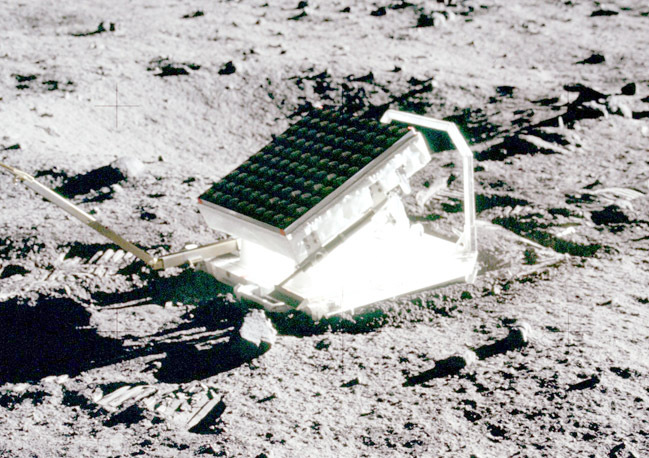 A pulse is sent and scientists record the following data: the duration of the initial beam, the velocity of the light, the duration of the flash on the mirror, the energy collected back, the wavelength of the laser, and how reflective the structure on the Moon is. With this data, they are able to calculate the distance down to the millimeter. Before, astronomers relied on parallax to measure the distance to the Moon. This technique is still used today if the planet is too far away; however, it is not as precise as shooting lasers at planets. Or as fun. Lasers are focused, intense beams of light. They are very useful for measuring distances because they travel at a constant rate through the atmosphere and can travel much longer distances before divergence or losing intensity. Unlike white light, lasers are less likely to disperse. A laser pulse will retain much of its original intensity when reflected off the planet—this is crucial when calculating the distance to an object. They reflect that beam in a parallel path straight back to the source of the laser. When firing the laser, it generates intense bursts of light only 100 picoseconds long, which is one-tenth of a billionth of a second. This light travels 7 earth circumferences every second. When measuring the Moon’s distance the laser pulse can take anywhere from 2.34 to 2.71 seconds, depending on how far away the Moon is: Moon distance ranges from 351,000 km to 406,000 km. These pulses are like little "bullets" of light. An alternate way to measure distance is to use radio waves. Radio waves are longest and contain the least amount of energy to make, compared to other electromagnetic waves. Since 1961, scientists have been able to use radar to measure interplanetary distances. They transmit a radar signal to another planet and measure how long it takes for the radar echo to return. Since radio waves are a type of electromagnetic radiation, they travel at the speed of light. Due to the travel time between Earth and the Moon, the reflected radio signal is delayed, typically, by a few seconds. However, in order to accomplish this, a scientist needs a giant antenna. To test general relativity, of course! When Einstein conceived his theory of general relativity, he alleged that it was the only way to measure gravity precisely. This theory helps us plan interplanetary probe trajectories but doesn’t help us get the precise measurement. Astronomers are trying to see how gravity behaves in space: they want to know if the Earth and the Moon fall towards the Sun at the same acceleration. Turns out they don’t. Every year, the Moon has been traveling away from the Earth, at a rate of 4 cm. The reason for this is because of the action of the Earth's tides and the Earth’s gravitational pulls. The Earth keeps the Moon in orbit by the gravitational force it emits, pulling and pushing the Moon away from it. Scientists are also trying to predict gravity. Gravity works on both objects in an interacting pair, so when the Sun's gravitational pull bends the Earth into an orbit, the Earth pulls back on the Sun with exactly the same force, in the opposite direction—at the same time, the Earth is being pulled into the center of the Milky Way. To learn a planet's mass, astronomers will typically measure the movement of the star caused by the gravitational tug of an orbiting planet. Every year, planets are pushed slightly off their rotations because of gravity. For the last three years, astronomers have been using satellites and lasers to measure the Earth’s surface. It’s called Advanced Topographic Laser Altimeter System (ATLAS). ATLAS is a single beam that is split into six beams, which are arranged in pairs of three to better gauge the slope of the Earth. The laser reflects off the ground or trees back to the receiver. The satellite then matches those times and determines the height of Earth’s surface. The goals of the project are to measure how much the ice sheets in Greenland and Antarctica contribute to sea levels, to measure how ice sheet glaciers, and more, are gaining or losing mass in different regions (to help researchers determine the mechanisms behind those changes), to estimate the thickness of sea ice and monitor any changes, and to measure the height in forests to calculate the amount of vegetation in a region. The Moon's gravitational pull causes two bulges of water on the Earth's oceans: one where the ocean waters face the moon and the pull is the strongest. The other one is where the ocean waters face away from the moon and the pull is the weakest. These bulges cause high and low tides. As the Earth rotates, the high tidal bulge actually sits slightly ahead of the Moon. Some of the energy of the spinning Earth gets transferred to the tidal bulge by friction. The tidal bulge provides a small amount of energy to the Moon, pushing it into a higher orbit. But the energy gained as the Moon is pushed higher is balanced by a reduction in the energy of its motion, so the acceleration provided by the Earth's tides is actually causing the Moon to slow down. We don’t need to worry about the moon floating off, though. The gravitational push will last for a year or millions. Scientists don’t know when exactly when the moon will stop pulling away from the Earth, but it will. The push can slow down to millimeters before it stops. The Moon will then pull itself towards the Earth. This will increase the gravitational pull between the Earth and the Moon, making our low tides lower and high tides higher. This is important when we are looking at different planets for life.